(MoneyWatch) Do you have champagne tastes, but your company has a beer budget? Comfort while traveling might seem like a luxury, but it is essential to your productivity. 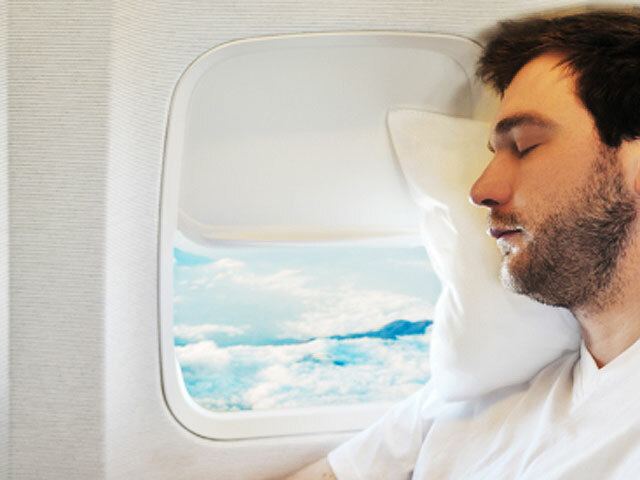 If you spend hours up in the air flying economy, you can arrive tired and stressed, and not exactly in prime shape for working. That doesn't mean you have to beg your boss to splurge for the upgrade. Here are five savvy tips from experienced business travelers that will make you feel like you feel like a million bucks by the time you arrive at your destination (without costing your company the same). One of the worst parts of flying economy are the long check-in lines. If you're smart and have a flexible enough schedule, you will time your travel so you never have to deal with them. "Airports are at their busiest in the early morning on weekdays," notes Mathias Friess, CEO of Webjet, a international online travel agency. If you fly the night before, you'll avoid the crowds, and if you book an airport hotel, the small extra cost may be made up by finding a less popular (read: cheaper) flight. Focus your miles on one or two airlines, and then start using the airline's branded credit cards. "Every dollar I spend is on credit and gains miles. I once flew and stayed in a 4-star hotel for free for a week for a business trip using only frequent flyer miles. Frequent flyer credit cards [also] can actually lower the cost to check baggage. The Delta Gold Amex allows passengers to check a free bag," notes Michael Stanat, global research executive with SIS International Research. He adds that some cards also offer free access to airport lounges. If you don't try to get upgrades or freebies, you never will. "Traditionally in economy class, they make you wait until the plane has reached a certain altitude before serving drinks. I've found that if you ask the flight attendant for a bottle of water or a can of ginger ale when you first get on the plane as you board, they will just give it to you right then and there," shares Richard S. Bernstein, CEO and Founder of Richard S. Bernstein & Associates, Inc., a national health care and life insurance company. And consider paying a few bucks for some small luxuries, like a pillow or blanket. "Think of it this way: What's better, paying a couple hundred dollars extra for business class or pay a couple bucks for the amenities of business class?" says Bernstein. In business and first class, you'll be greeted with complementary products like moisturizers, that can make a flight seem more like a few hours at a spa than a part of your business day. You can recreate that atmosphere in economy. "Visit 3floz.com. This is the site where you can pick up all kinds of wonderful cosmetics that are three fluid ounces or less -- which of course, is ideal for going through security at the airport," recommends Debbi Karpowicz Kickham, president of Maxima Marketing, and author of The Globe Trotter's Get-Gorgeous Guide. Some airlines have partnered with Klout, the analyzer of social media influence. "Because I'm a 'Chairman' on US Airways, that puts me at the top of the food chain, which means I almost always get complimentary upgrades to first class," says Teri Gault, CEO and founder of The Grocery Game, a coupon and savings site. This social media "in" also allows Gault to check three free bags. It's worth seeing if your favorite airlines are running any promotions through Klout or other social media sites.